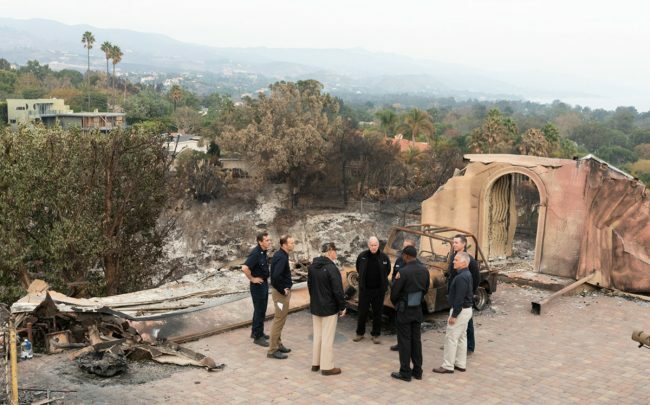 Despite an estimated $5 billion in real estate damage the Woolsey Fire inflicted, Phillip Vogt’s Malibu home was the only one in his area left relatively unscathed. The tale of his property, detailed in a Wall Street Journal report, could become a model for how homeowners in high-risk areas — and who have the significant financial means — can protect their properties against future wildfires. Knowing it was in one of the most fire-prone areas, Vogt constructed his home with added protections like concrete-and-steel walls and rooftop ember guards, the Journal reported. An extra-long water hose has access to a 50,000-gallon water tank. The added measures increased the $3-million home construction cost by about 20 percent, he told the Journal. Since 2007, California has required new homes in high-fire areas to include fire guards, and officials have called for improved guidelines to eliminate the risk of homes being made with flammable materials or constructed too close to vegetation. But after the increase in major fires in the state over the past two years, property owners have taken matters into their own hands. Scott Gillen is building a luxury community with fire-retardant walls, and after the Woolsey Fire, he said he would offer homeowners their own firefighter team.